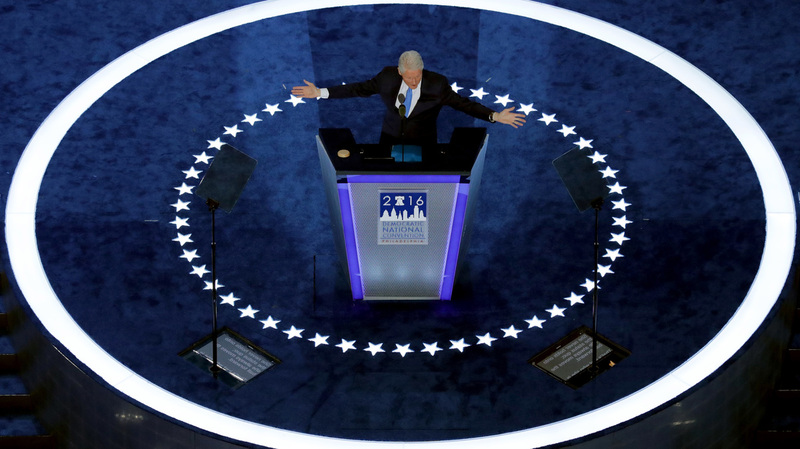 Bill Clinton Counters The Greatest Criticisms Of His Wife In His DNC Speech Bill Clinton had a formidable challenge on Tuesday: to sell the American people on one of the most disliked presidential nominees in political history. Former President Clinton defended Hillary Clinton's career during his speech at the Democratic National Convention on Tuesday, the night she formally became the party's presidential nominee. Bill Clinton had a formidable challenge on Tuesday: to sell the American people on one of the most disliked presidential nominees in U.S. history. He had to "humanize" her, in punditspeak — Hillary Clinton is more of an idea or icon to people than a person, as NPR's Steve Inskeep suggested Tuesday night. A long speech, though its purpose is clear: he's painting an extended portrait of a human being, who's often talked about as if she isn't. And given that Americans have for decades had a closeup view of the Clintons (complete with their dirty laundry), Bill Clinton had to tell people something they didn't know. Instead of introducing himself and the candidate to the nation, as political spouses often do at conventions, he had to reintroduce her. And in that reintroduction, he seemed to be trying to counter some of the most stubborn attacks on his wife. Is Clinton a good politician? As Hillary Clinton herself has said: "I am not a natural politician, in case you haven't noticed, like my husband or President Obama." "She won the Democratic primary by spending years slowly, assiduously building relationships with the entire Democratic Party. She relied on a more traditionally female approach to leadership: creating coalitions, finding common ground and winning over allies. ... This work is a grind — it's not big speeches, it doesn't come with wide applause, and it requires an emotional toughness most human beings can't summon." Bill Clinton spent the speech explaining his wife's strengths. In doing so, he made the drudgery of policymaking and wonkiness into virtues. Twice he talked about his wife as doing the work that other people might find "boring." Another time he described her work on health care policy (which culminated in the Affordable Care Act 16 years after her own overhaul attempt failed) as "piece by piece, pushing that rock up the hill." Bill Clinton — a hypercharismatic politician — made the case for someone many see as a poor politician. And he tried to paint a different picture of what a good politician is: someone who is more of a doer (or "change-maker") than a talker. Or, as Bill put it, "Speeches like this are fun," he said. "Actually doing the work is hard." Has Clinton always wanted to be president? The first part of Bill Clinton's speech was a love story interwoven with his wife's resume. And that resume painted a picture of a high-achieving woman who doesn't crave the spotlight. He did talk about her rise, and he listed ambitious projects she has undertaken, but he didn't describe her as politically ambitious. This story runs counter to the claim that Clinton wanted the presidency for herself. Bill told about a woman who had to be persuaded to be a political leader. In this narrative, it was other people who were constantly saying she had political potential, not Clinton herself. He told about how, early in their marriage, he tried to convince she should get into politics. He told about Hillary testifying before the education committee in Arkansas, and how afterward, the chairman said, "Looks to me like we elected the wrong Clinton." He told about how "Congressman Charlie Rangel and New York Democrats urged Hillary to run" for New York senator, though the idea "had never occurred to either one of us." He told about how President Obama had to ask her multiple times to be secretary of state. Highlighting those details in the narrative allowed him to describe a woman who put her head down and worked for decades, as opposed to standing and staring up the political ladder. Bill described how people who have worked with Hillary "know her to be able, straightforward and completely trustworthy." That last word sticks out for anyone who has been watching the 2016 election for more than five minutes. Poll after poll shows that the American people do not see Hillary Clinton as trustworthy. The investigation into her private email server while secretary of state in particular has damaged her reputation among many voters. Bill Clinton took a different stab at talking about trustworthiness. He painted a picture of a person who is eminently dependable, with "an extra responsibility gene." His message here was clear: She says she'll do something, then does it, both in her personal and her professional life. Framing Hillary as that dependable workhorse came with another benefit, according to Jennifer Lawless, professor of government at American University. "In an election cycle where people are weary of the establishment, it's a smart move to make the case that she never sought to join it," she said. Americans already really, really do not trust government. It may have therefore also helped counter the "untrustworthy" narrative that he didn't describe her as wanting to join an institution that most voters don't trust. In making all these cases, Bill Clinton's task on Tuesday was similar to what Donald Trump's family tried to do at the Republican convention last week. In that sense, this election is unique: Both major-party candidates are uber-famous and extremely unpopular after spending decades in the public eye. It's been up to their family members to take on the massive task of chipping away at and shifting those long-established narratives.